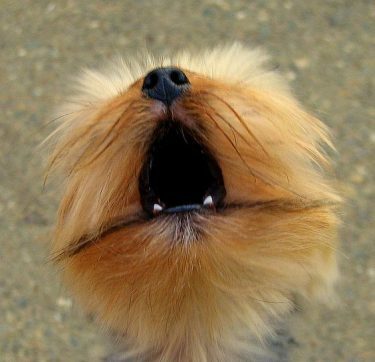 FAQ: How do I get my dog to stop barking??? I got a phone call today from a woman in Charlottesville, we’ll call her Pam, who was having a major issue with her Yorkshire Terrier’s barking. Pam and her husband live in an apartment complex and were worried all the dog’s barking was going to cause problems with their neighbors, in addition to the fact that the barking was already driving them nuts. So how do you get a dog to stop barking at everything?? The very first thing I recommend for barking is to increase your dog’s exercise by going on longer walks. Barking is very often a symptom of a dog having excess energy or being bored. Barking is a way for the dog to release some energy. Dogs need daily physical exercise to keep them feeling good. Using structured exercise as an outlet for their excess energy is much more appropriate and productive than barking. I also recommend increasing your dog’s mental stimulation. I told Pam she could spend some time during the day training her dog or teaching her dog some tricks. Puzzle toys and food dispensing toys are another way to increase mental stimulation. Making your dog work for their food at meal times by doing some commands or offering focus and attention is also a great way to get dogs using their brain. Playing games such as tug of war or fetch is another great option. Once you know that your dog is getting their physical and mental exercise on a daily basis then you move onto training. I recommend teaching dogs that bark a lot a Quiet command. I have a lot of clients who don’t mind a little barking or who actually like the dog to bark at the door in the case of an unwanted visitor late at night when they’re home alone, but everyone wants the barking to stop when they ask. When your dog is barking say “Quiet” and (if they don’t stop barking immediately) follow the command with something the dog finds unpleasant such as a squirt of water from a spray bottle, a loud noise or a spray of air from a Pet Corrector. Another option is to say “Quiet” and then remove your dog from the room (put in their crate if you use a crate) for several minutes by themselves or until they are quiet if they continue barking even after removing them. 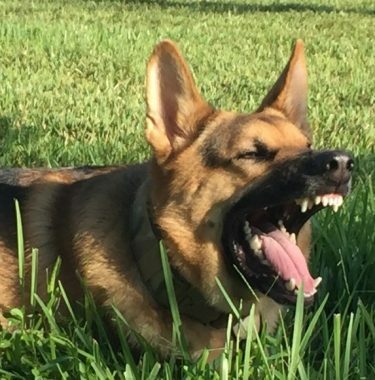 Once your dog starts to understand that if they choose to keep barking when you give the Quiet command there are going to be consequences, they will start to respond positively to your command. If you give the Quiet command and your dog stops barking immediately, lavish your dog with praise and treats or perhaps something yummy to chew on. Living in a Multi-Dog Household: Cant we all just get along?? We humans recognize that dogs are pack animals, meaning they are a highly social species who choose to live in groups. They are motivated to seek out contact with others and to avoid social isolation. However when adding a new dog to an existing pack or creating a brand new pack when households merge, for example, successful integration and peaceful coexistence is not always a given. It takes some work (sometimes a lot of work!) to live successfully in a multi-dog home. The most successful multi-dog households are the ones where leadership is clearly defined. Being clear about everyones role in the household makes it easiest for the dogs to understand where they fit in. The owner should be the one who is in charge, who makes the decisions and who provides guidance and direction to the other members of the group. Being the leader doesnt mean being a bully, being forceful or being intimidating. A good leader is fair and consistent and means what they say. The phrase benevolent dictatorship gives a good mental picture to this idea. Commands should be non-negotiable. Good behavior is rewarded, bad behavior is corrected. Controlling resources is an easy way to establish yourself as the clear leader. Access to things like food, toys and play, furniture, the yard and other freedoms should all come through you. Requiring polite behavior and good obedience before dolling out these resources to your dogs reinforces your position. As a good leader you also have the role of Advocate for each of your dogs. Dont allow pushy, bratty or annoying behavior from a dog and interrupt any inappropriate behavior early on. If a dog is showing uncertainty or discomfort with another dogs interactions and their attempts at subtle communication are not being respected, you should step in and back up the dog being bullied as soon as you notice this. By advocating for the uncomfortable dog, you show them that they are being heard and you will stand up for them if needed. This prevents dogs from feeling like they need to escalate their communication. An escalation in canine communication usually means going from subtle body language signals like avoiding eye contact, lip licking and moving away from the other dog to growling and then biting. By being a good advocate for your dogs, they shouldnt feel the need to escalate to more aggressive behavior. Meeting the individual needs of each dog in your household will keep them happy and out of trouble. A dog who is living a fulfilled life is far less likely to get into trouble. Most dog owners do a good job of meeting the basic needs of their dogs: food, water, shelter, and medical care. But what Im talking about is fulfillment in every aspect of their canine lives. Physical exercise needs are something we, with our busy family lives, sometimes slack on, myself included. Dogs that arent getting their daily exercise needs met (key word daily) is one of the most common causes for problem behaviors in the home like barking, digging, and chewing. In addition to physical exercise is their need for mental exercise. Activities that require a dog use their brain, pay attention and focus or that ask them to problem solve are critical to their fulfillment. Think of it like the smart kid in class who isnt being challenged and ends up turning into the trouble maker. Certain breeds of dogs have much higher needs in this area i.e. working breeds like the Border Collie, German Shepherd, and Jack Russell Terrier. Training, canine sports, interactive toys and play are all great ways to meet your dogs mental exercise needs. The need that most often gets forgotten or ignored is a dogs instinctual needs. Humans have been breeding dogs for hundreds of years for specialized jobs, skills and behaviors. Today, however, the majority of dogs are kept as family pets and are no longer being used for their original purpose. This can end up being a cause for conflict. Behaviors like digging, chasing, herding, hunting, retrieving and even barking can be instinctual to certain breeds. We must provide an alternative appropriate outlet for our dogs to practice these behaviors. Thankfully there is such a wide array of sports and activities available to dog owners including Agility, Weight Pull, Obedience, Field and Hunting Trials, Dock Diving, Disk Dogs, Rally, Tracking, Lure Coursing, Flyball, and even Carting and Bikejoring. Use management techniques to prevent bad behavior and opportunities for bad choices from your dogs. Barriers, baby gates, dog crates and leashes are all useful management tools. By feeding meals in each dogs crate, for example, you can avoid any conflict during mealtimes. This can be especially helpful if you have a food inhaler and also a food grazer. I practice this in my home when I dont have time to stand around and supervise as our grazer takes her sweet time finishing her food. Give high value toys or chew bones with each dog on a separate bed or in crates and always with an adult present to supervise. There should be no unsupervised interactions, especially early on when the dogs are trying to work out the group dynamics. Pack walks or walking the dogs on leash together is an excellent way to build social drive and an us mentality instead of me vs. them mentality. It gets everyone moving in the same direction towards a common goal. Remember that its also important to give the dogs some down time away from each other so they can relax and decompress. Focus your training on creating calm behavior around each other, sharing space and existing quietly in the same room or area. Training that builds good impulse control like long sits and downs and the place command should be practiced often. And finally, at some point you may need to be realistic about what can be changed and what will need to be managed. Be prepared that some dogs may require relying heavily on management for their entire lives; the crate and rotate technique is one way to handle this. 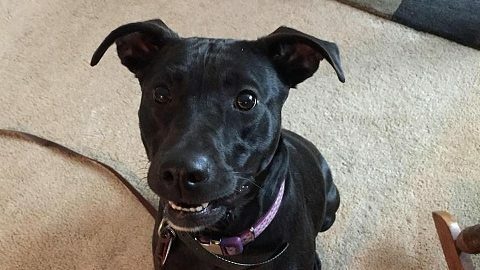 1.5 year old female rescue Lab/Pit mix. Before Training: excitable, jumps and nipped at people out of over-excitement, easily distracted, selective listening, no self-control. What Owner has to say: Pepper went to the farm with us to pick blackberries yesterday and she was so well behaved. We didnt let her run on her own at the time because I didnt know where the cows were but she had 4 deer running across my brothers driveway in front of her and she only stared didnt try to take off or anything! Its funny when you said wear the collar as much as possible so she doesnt just think its for training and now I see she does act like an angel all day long while its on! Well be making her wear it more often now. My brother did see a couple of the commands sit, stay and lets go and was totally impressed with how well behaved she was at his house! Its working and she has calmed down so much in the last few months! Thank you!! 3 year old female rescue cockapoo. Before Training: Very dog reactive- barking, whining, lunging, just generally going nuts at the sight of other dogs. Needed better recall and general obedience. Owner knew she needed help and wanted to find a way to make her dog calm, happy and well-behaved. 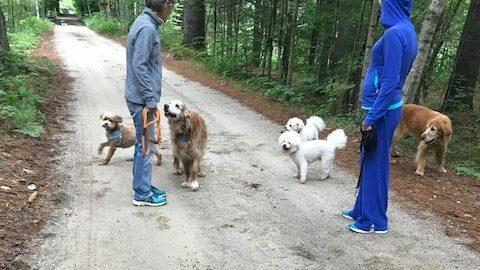 Training was important because: Owner spends the summer in Maine with lots of family and their dogs. They do a lot of off leash walking and hiking and the dogs spend a lot of time together. After Training: Can walk past dogs without making a peep/fuss/over-reacting, great off leash reliability and obedience, much more tolerant and at ease around dogs and is able to socialize and spend time with dogs.